In general it seems typical that VMware Tools gets installed on the Guest OS and then left alone after that. While doing some reading and working on some “slowness” issues, I’ve found the Tools CLI to become very handy and powerful. I’m not covering all of the commands there but the documentation from VMware does a good job. **NOTE certain version of Fusion have a “Clean Up Virtual Machine” button and Workstation has a “Compact” menu command that will do the same thing. There are many more commands that can be run from within the Guest OS, as I stated I’ve been using and seeing these commands used to track down slowness issues within VMs. Note these commands were taken from the following User’s Guide from VMware andVMware vSphere 6.0 Documentation Center. In May of 2015, we did a video around VMware NSX vs. Cisco ACI. As part of that video, we made the prediction that VMware NSX and Cisco ACI would not be an either/or discussion in the future (I also did a webinar on the topic that you can download here). At the time, the common question we were getting from clients was if they should be using NSX or ACI. My opinion was that Cisco ACI quite well complimented the feature sets of VMware NSX and that one could really support the other. Now let’s fast forward to last month (February 2016) to Cisco Live Berlin where an announcement was made that supported just that idea. In sessions at the conference, they talked about a number of overlay networks in Cisco ACI and specifically mentioned VMware NSX. So what are these use cases? I’m planning on doing a series of videos to explore the topic further. The next video will discuss heavily utilizing Cisco ACI with an overlay of VMware NSX. After that, we’ll look at the opposite – more heavily leveraging the feature sets of NSX on top of the fabric automation feature sets that exist in ACI. 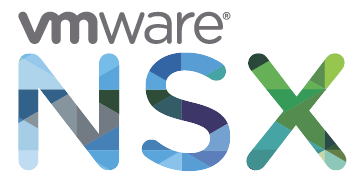 NSX has been the acronym on the lips of everyone in the SDN space. So I have been studying the VMware NSX software defined networking platform in preparation for my VCIX exam in the coming months and I have this few thoughts to share from some of my study materials about this exciting product from VMware, but what is it and what does it mean to your organization?VMware NSX is a network virtualization platform from VMware. The software is reportedly able to operate using any hypervisor and it is a completely non-disruptive solution which can be deployed on any IP network from any vendor – both existing traditional networking models and next generation fabric architectures. The physical network infrastructure already in place is all that is required to deploy a software-defined data center with NSX. i. Physical Networks are hard to scale in multi-tenant’s data-center environment i.e. Business Units, Customers and acquisitions can benefit from this type of overlay topology. ii. Physical networks make VM mobility across data centers tougher when we use complex layer 2 adjacency design. Logical networks allow for greater automation and ease of provisioning since everything is done in software. (Logical Switching, Firewall, Routing, Load balancing). iii. Server virtualization, a software abstraction layer (i.e. server hypervisor) reproduces the familiar attributes of an x86 physical server (e.g. CPU, RAM, Disk, NIC) in software. This allows components to be programmatically assembled in any arbitrary combination to produce a unique VM in a matter of seconds. With NETWORK virtualization, the functional equivalent of a “network hypervisor” reproduces layer 2 to layer 7 networking services (e.g. switching, routing, firewalling, and load balancing) in software. These services can then be programmatically assembled in any arbitrary combination, producing unique, isolated virtual networks in a matter of seconds. With VMware NSX, existing networks are immediately ready to deploy a next generation software defined data center. Customers are using NSX to drive business benefits as shown in the figure below. Security: NSX can be used to create a secure infrastructure, which can create a zero-trust security model. Every virtualized workload can be protected with a full stateful firewall engine at a very granular level. Security can be based on constructs such as MAC, IP, ports, vCenter objects and tags, active directory groups, etc. Intelligent dynamic security grouping can drive the security posture within the infrastructure. NSX can be used in conjunction with 3rd party security vendors such as Palo Alto Networks, Checkpoint, Fortinet, or McAffee to provide a complete DMZ like security solution within a cloud infrastructure. NSX has been deployed widely to secure virtual desktops to secure some of the most vulnerable workloads, which reside in the data center to prohibit desktop-to-desktop hacking. Automation: VMware NSX provides a full RESTful API to consume networking, security and services, which can be used to drive automation within the infrastructure. IT admins can reduce the tasks and cycles required to provision workloads within the datacenter using NSX. NSX is integrated out of the box with automation tools such as vRealize automation, which can provide customers with a one-click deployment option for an entire application, which includes the compute, storage, network, security and L4-L7 services. Developers can use NSX with the OpenStack platform. NSX provides a neutron plugin that can be used to deploy applications and topologies via OpenStack. Application Continuity: NSX provides a way to easily extend networking and security up to eight vCenter either within or across data center. 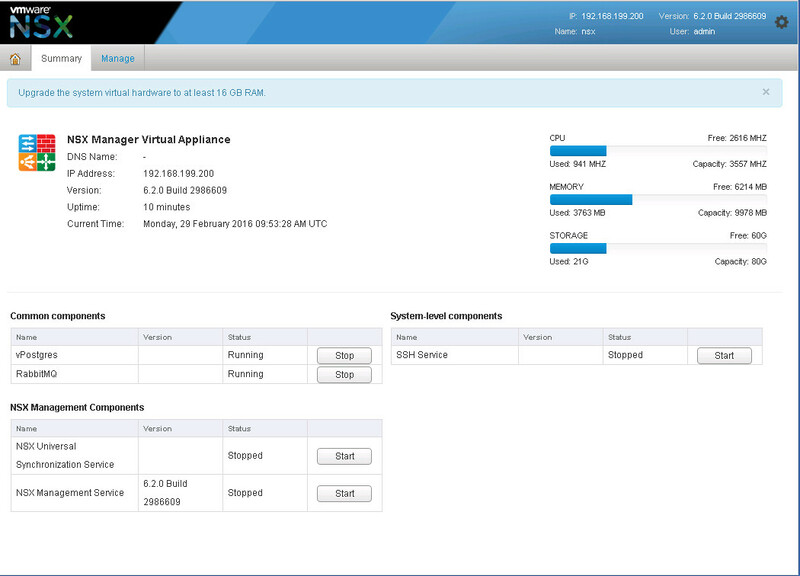 In conjunction with vSphere 6.0, customers can easily vMotion a virtual machine across long distances and NSX will ensure that the network is consistent across the sites and ensure that the firewall rules are consistent. This essentially maintains the same view across sites. NSX Cross vCenter Networking can help build active – active data centers. 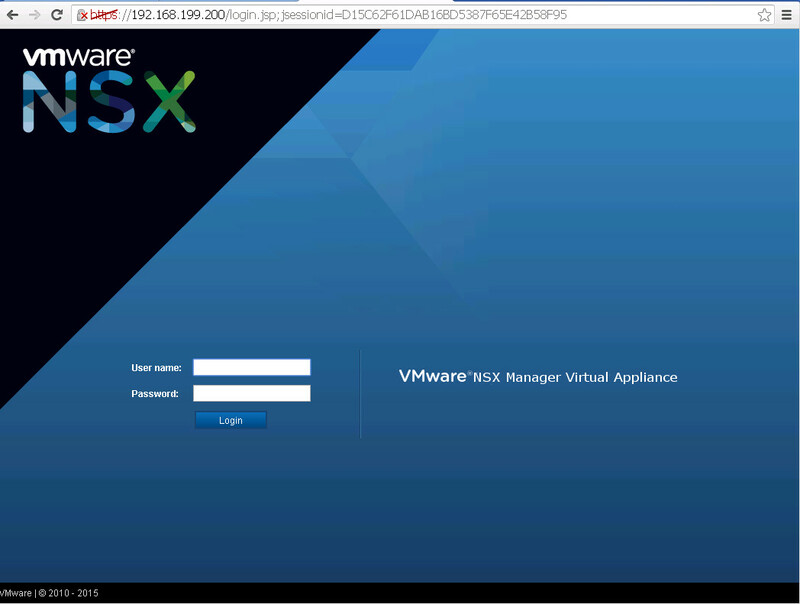 Customers are using NSX today with VMware Site Recovery Manager to provide disaster recovery solutions. NSX can extend the network across data centers and even to the cloud to enable seamless networking and security. Switching: Logical switching enables extension of a L2 segment / IP subnet anywhere in the fabric independent of the physical network design. Routing: Routing between IP subnets can be done in the logical space without traffic leaving the hypervisor; routing is performed directly in the hypervisor kernel with minimal CPU / memory overhead. Routing is done by the Distributed Logical Router and one of the features of the Edge Service gateway. It supports Static and Dynamic routing protocols (OSPF, ISIS, BGP). The distributed logical routing (DLR) provides an optimal data path for traffic within the virtual infrastructure (east-west communication). Additionally, the NSX Edge provides an ideal centralized point for seamless integration with the physical network infrastructure to handle communication with the external network (north-south communication) with ECMP-based routing. Connectivity to physical networks: L2 and L3 gateway functions are supported within NSX to provide communication between workloads deployed in logical and physical spaces. 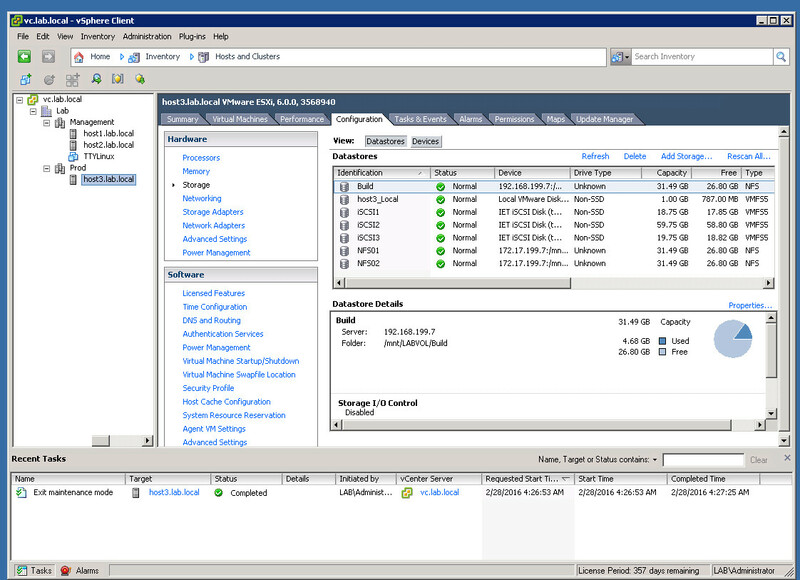 Edge Firewall: Edge firewall services are part of the NSX Edge Services Gateway (ESG). The Edge firewall provides essential perimeter firewall protection which can be used in addition to a physical perimeter firewall. The ESG-based firewall is useful in developing PCI zones, multi-tenant environments, or dev-ops style connectivity without forcing the inter-tenant or inter-zone traffic onto the physical network. VPN: L2 VPN, IPSEC VPN, and SSL VPN services to enable L2 and L3 VPN services. The VPN services provide critical use-case of interconnecting remote datacenters and users access. Logical Load-balancing: L4-L7 load balancing with support for SSL termination. The load-balancer comes in two different form factors supporting inline as well as proxy mode configurations. The load-balancer provides critical use case in virtualized environment, which enables devops style functionalities supporting variety of workload in topological independent manner. DHCP & NAT Services: Support for DHCP servers and DHCP forwarding mechanisms; NAT services. NSX also provides an extensible platform that can be used for deployment and configuration of 3rd party vendor services. Examples include virtual form factor load balancers (e.g., F5 BIG-IP LTM) and network monitoring appliances (e.g., Gigamon – GigaVUE-VM).Integration of these services is simple with existing physical appliances. In more post, as i advance in my studies i will go deep on this wonderful product from VMware. Head, Solutions Architect at Integrated Laynet Technologies Ltd. The Ravello Systems blueprint of Autolab 2.6 is a great point of start for any deployment vSphere based. In this case, I’ll report my experience where I used Autolab 2.6 for NSX 6.2 deployment. I will jump over the steps needed to deploy Autolab in Ravello, I’ll report it in another post. 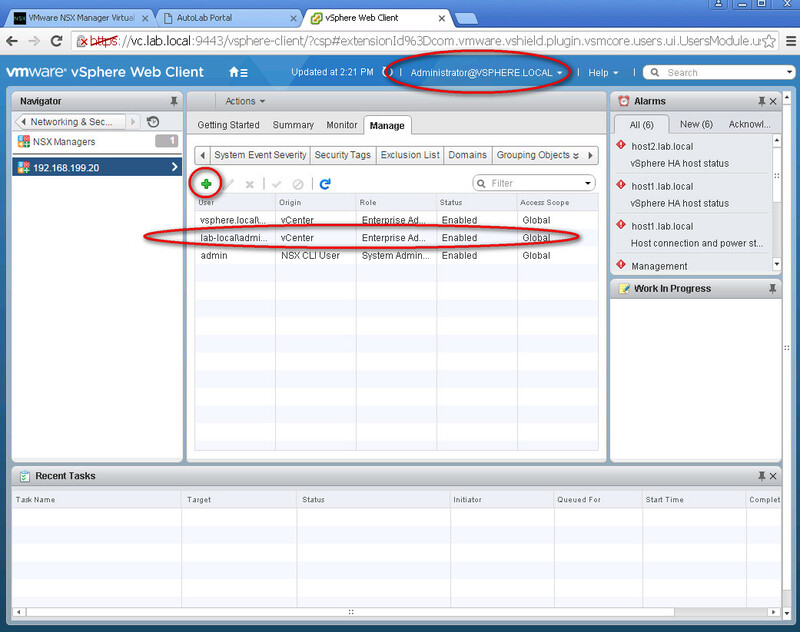 This first part will reach the point of deployment of NSX inside the Autolab’s vCenter. We’ve to move away from standard in the moment when, to have 2 clusters, 3 hosts are nomore enough – 3 hosts is the standard of Autolab. Luckily the guys at Labguides had a good intuition, so that they added at IPXE’s ESXi menu the “install fourth ESXi” line. So, my task was only to deploy a brand new application from blueprint, save one of the standard ESXi, delete that application and deploy this new ESXi in my current installation, modifying all the networks and hosts stuff. So, installed the fourth as I did with previously ones, I planned to have 2 Clusters: Management and Prod. The Management cluster will serve NSX Manager, the Prod is the resource cluster, so it will take care of the Edges. Now we can assist at the import process. In my case, I had to reboot the host to permit HA agent to be installed on it. 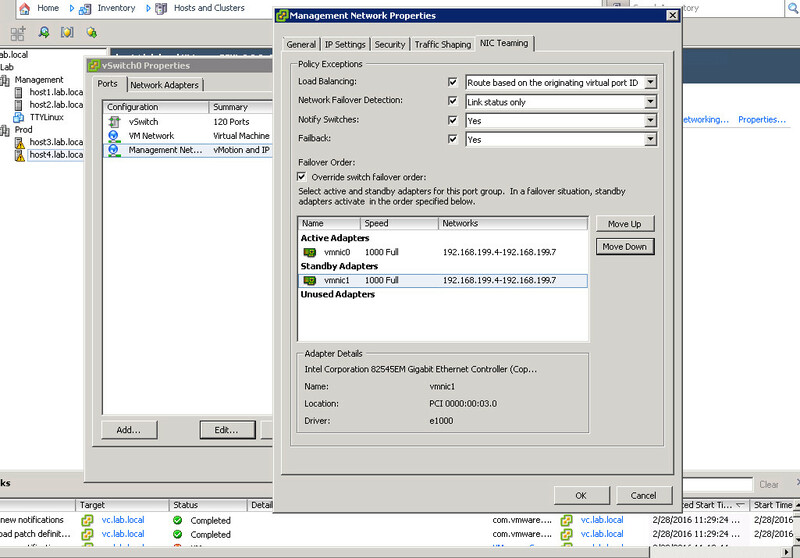 Since the Add Host wasn’t automated by Autolab as the previous ones, but manual, I had to add NIC1 in teaming to the first vSwitch, to create the other vSwitch and to recreate all the storage connections. I’ll jump this part since the purpose of the post is the NSX installation, and not recreate from scratch an host to be compliant with Autolab environment. Anyway, it’s simply a “copy&paste” process from the existing ones to the new one. Regarding iSCSI datastores, we’ll have to set up the HBA interfaces. Time to deploy NSX. 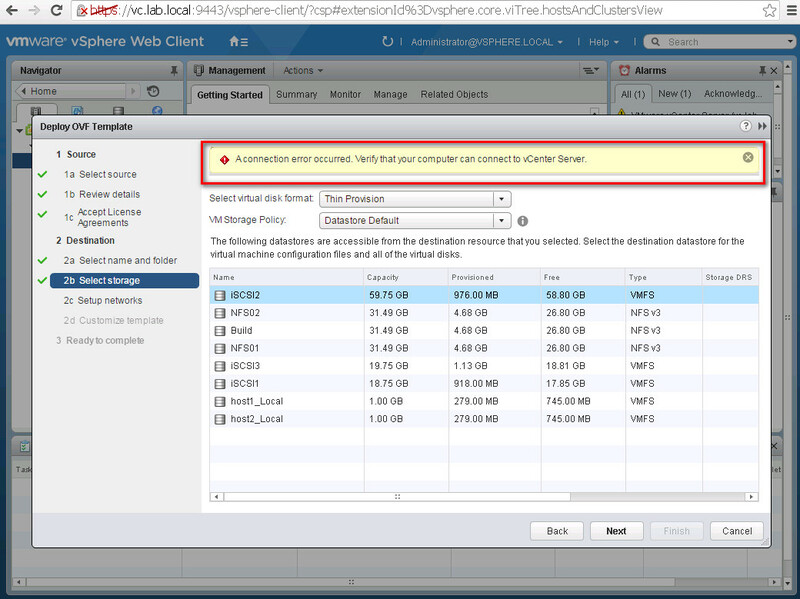 After download the OVA file we’ll use vCenter to deploy it on Management cluster. We’ll use the webclient and not C# client since the first one will give us more options (if we didn’t before, to deploy using webclient we need to download the client integration plug-in – link appears during deployment). Using IE11 I wasn’t able to use the plugin, and neither Windows Authentication. Following several forum’s advices (https://communities.vmware.com/thread/515713?start=0&tstart=0 is one of them), I downloaded and used Chrome. By the way, I don’t know if this is only my problem, but my vC server didn’t start automatically the vSphere Web Client service, although set as automatic. It’s important to check the box accepting the extra configuration options. It works now, and I’m able to continue. The network to map is the “Servers” one, but it’s not important: we only have one physical network, so it doesn’t matter. In the last page we’ll be asked a password for default CLI user, a password for privileged and Network infos. 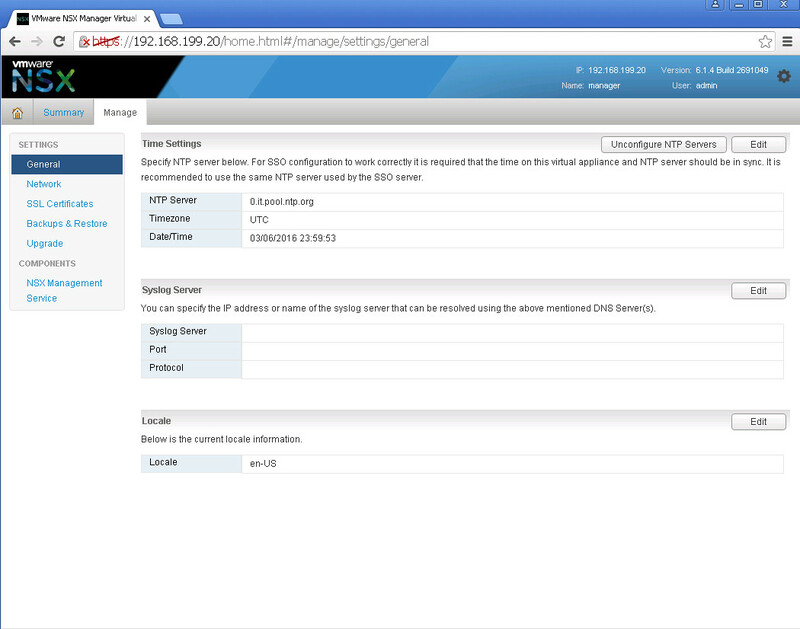 We’ll assign the NSX the IP 192.168.199.200, providing an entry in DNS too, as nsx.lab.local. The same DC server acts as NTP server. I don’t choose to start it automatically because I could be forced to modify the resources assigned to nsx: my ESXi’s could offer 24GB of RAM and 12 CPUs – yes, I modified the default values of Autolab. IMPORTANT: you must change the vNIC from VMXNET3 to E1000, according to Martijn Smit’s post: https://www.vmguru.com/2016/01/ravello-systems-vmware-nsx-6-2-management-service-stuck-in-starting/ . DO IT BEFORE STARTING THE VM – it won’t work changing it after, I had to redeploy. AND you should do it via SSH’ing the ESXi, not deleting and recreating from GUI because if so, the VM will rename it in eth1. I must reduce assigned RAM from 16GB to 12GB and CPU from 4 to 3, otherwise it won’t start. After the first boot, although, if you shut down, you’ll be allowed to use 16GB and 4CPU, as adviced. This is the end of this first part. 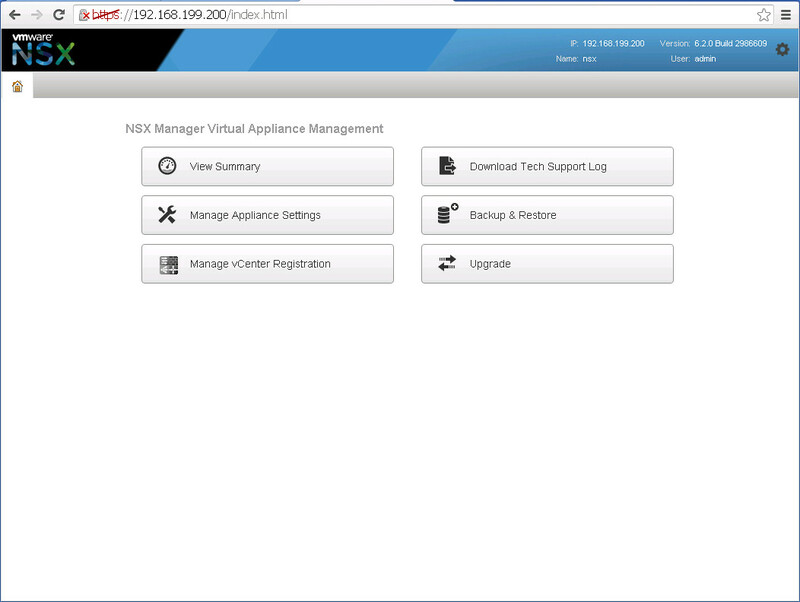 In the next one we’ll configure the NSX manager and we’ll deploy our Edges and VXlans.